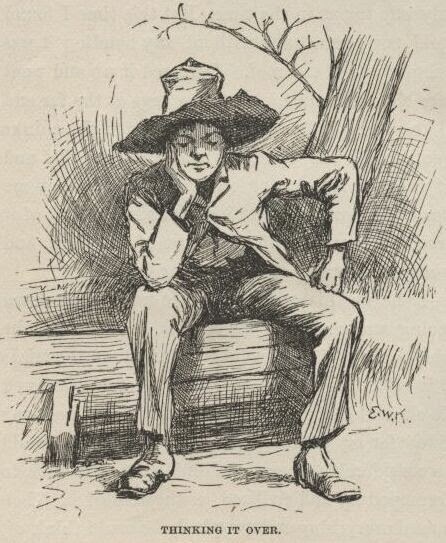 The Adventures of Huckleberry Finn often gets lumped with The Adventures of Tom Sawyer as a middle-school book, a 19th-century young-adult novel. After all, the two books share a central cast of characters and concern themselves with the often miscreant adventures of pre-teen boys. Yet Huckleberry Finn is a much more serious book, and it has come to occupy a central position in the American canon in a way that Tom Sawyer never could. Twain’s aspirations are different in his later book, essentially a coming-of-age story, a bildungsroman. Huck’s journey down the Mississippi with Jim is one that takes him away, literally and figuratively, from the world of Tom Sawyer. The book begins with Huck’s rejection of the hijinx of Tom’s gang, and, on the raft in the big river, Huck finds himself in situations that call him to put aside Tom’s (and his) prankish ways, and adopt the ways of a man. One of those situations occurs late in the novel, when Huck and Jim have finally extricated themselves from the clutches of the Duke and the King, two swindlers who have never outgrown the Tom Sawyer Life Stage. Jim has been captured and is being held at the Phelps’ farm, and Huck, who for the entire story has been feeling guilty about not turning Jim in, decides to write a letter to Miss Watson back in St. Petersburg and tell her to come down and get her slave. He writes the note, and feels much better now that he’s no longer a deviant and committing a crime by helping a slave escape. Here lies the moral center of the book. The journey on the raft with Jim has forced Huck to consider the slave as a human being, and Huck cannot return to his former perspective. Huck’s conscience comes into direct conflict with his society’s values. When he tears up his letter he not only rejects Tom Sawyer’s ways, but those of an entire culture as well. When I teach this book I have a hard time getting my students to realize just what kind of a decision Huck makes here. Huck’s choice is devoid of righteousness, and it’s nearly impossible for us today to imagine ourselves in a similar situation, where we would find ourselves going against accepted opinion without simultaneously feeling righteous about our decision. Huck’s not helping Jim escape because he knows it’s the right thing; he’s helping Jim escape even though he’s been taught it’s the wrong thing. He believes that he’s going to go to hell for what he’s doing, but he does it anyway. Huck would never put it in these terms, but he’s tapped into a natural law that contradicts the rules of the Christian society in which he’s been raised. Following that natural law means being “wicked” in the eyes of the world, and Huck is willing to do it. Teaching this scene earlier this year got me thinking about how, exactly, a Catholic school helps its students prepare for decisions like Huck’s. On one hand, Huck tears up the letter because writing it would be unjust (though he would never use that word), and Catholic educators do a good job of making their students aware of all different kinds of injustice. Mission trips, service projects, and the like have become the heart and soul of campus ministry offices in high schools and colleges alike, providing students with valuable opportunities to encounter the unfamiliar (to them) faces of those living on the margins of society, to those lonely or disabled or otherwise suffering. These programs are an important part of any Catholic educational experience and are life-changing for many. Yet these types of activities are an incomplete preparation for the kind of independent decision that Huck wrestled with. The problem is that going on a mission trip or fulfilling a Christian service requirement presents the student with an opportunity to go along with a group of his peers, or to follow the voice of authority (whether that be a social group or of the school itself). Students also know that these kind of experiences are great resume-builders. It’s not surprising that schools market these activities with pitches along the lines of “have fun with your friends and help those in need!” or “spend a week among the poor and never see the world the same way again!” In doing so, they portray the service experience as ultimately serving the student, and if someone else gets helped out in the process, even better. Mission trips and service projects are important for student growth, but don’t demand from them the kind of moral courage that Huck’s situation demanded of him. Aware that he was condemning himself to hell, Huck tore up his letter anyway, a choice which benefited no one except Jim. The decision required true courage because it isolated him completely from those around him, unlike the decision to go on a service trip, which promises to bolster one’s social standing. Thinking for yourself means finding yourself, finding your own reality. Here’s the other problem with Facebook and Twitter and even The New York Times. When you expose yourself to those things, especially in the constant way that people do now—older people as well as younger people—you are continuously bombarding yourself with a stream of other people’s thoughts. You are marinating yourself in the conventional wisdom. In other people’s reality: for others, not for yourself. You are creating a cacophony in which it is impossible to hear your own voice, whether it’s yourself you’re thinking about or anything else. That’s what Emerson meant when he said that “he who should inspire and lead his race must be defended from travelling with the souls of other men, from living, breathing, reading, and writing in the daily, time-worn yoke of their opinions.” Notice that he uses the word lead. Leadership means finding a new direction, not simply putting yourself at the front of the herd that’s heading toward the cliff. So why is reading books any better than reading tweets or wall posts? Well, sometimes it isn’t. Sometimes, you need to put down your book, if only to think about what you’re reading, what you think about what you’re reading. But a book has two advantages over a tweet. First, the person who wrote it thought about it a lot more carefully. The book is the result of his solitude, his attempt to think for himself. Second, most books are old. This is not a disadvantage: this is precisely what makes them valuable. They stand against the conventional wisdom of today simply because they’re not from today. Even if they merely reflect the conventional wisdom of their own day, they say something different from what you hear all the time. But the great books, the ones you find on a syllabus, the ones people have continued to read, don’t reflect the conventional wisdom of their day. They say things that have the permanent power to disrupt our habits of thought. They were revolutionary in their own time, and they are still revolutionary today. The root of good leadership, then, is thoughtful encounter with the world’s greatest ideas, manifest in the canon. Products of introspection themselves, the great books must be met with introspection. I would go one step further: the fruit of introspection is language, and academic writing is where students are called on to respond thoughtfully to the great thinkers of the past—writers, artists, philosophers, and scientists alike. If true leadership arises from the ability to think deeply about a subject, then academic papers are the incubators of true leaders. Like Christian service projects, reading and writing can’t teach courage, but they can help forge the individual conscience, without which all courageous action is but sound and fury. I don’t mean to suggest that campus ministry offices in high schools and colleges start reading Things Fall Apart instead of sponsoring trips to Africa. Service opportunities of all stripes are valuable, because just like Huck, students need to encounter human beings who suffer from injustice to help bring an end to that injustice. Instead, I'd suggest that we recognize that in encouraging our students to be Catholic leaders, classroom teachers share responsibility with campus ministers and service organizers. In order for Christian service to avoid becoming an exercise in groupthink, we must also commit ourselves to developing independent thinkers, an enterprise that occurs in the classroom. There, our students can read and and think and write about Huck, the crucial step in becoming like him.